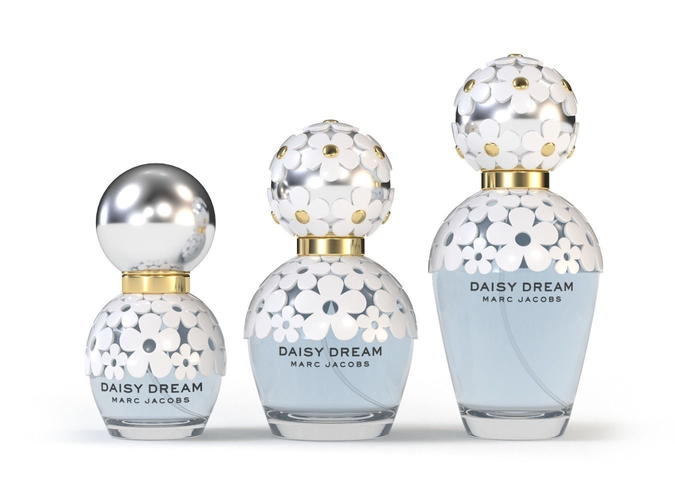 Eau de toilette spray Daisy Dream by Marc Jacobs. Collection includes three different sized bottles: 30ml, 50ml and 100ml. Bottle glass is modelled with thickness and liquid inside glass bottle is slightly overlapping glass mesh. That provides most physically acurate renderings in most modern render engines. Each file contains all three bottle models. Modeled in 3ds max. Model is scaled to proper real world dimensions. Scene units are in cm. All objects, materials and textures are properly and uniquely named. All transformations are reset and models are placed at scene origin. All texture paths are set to relative. Materials are prepared for Corona and Scanline renderers. File for Scanline renderer has very basic materials and will NOT render the same as in preview images. Preview images are rendered with Corona. Textures are collected in one arhive. Render scene is not included. Scene has 1 high quality texture in 1400x1400 resolution. NOTES In order to maintain correct look of the model, it is important that your application would support rendering of refraction. Without refraction it might be very hard to recreate exact look as in preview images. Please keep this in mind, especially if you're intended to use the model in real time apps. You have amazing rendering skills. Your models look real.